What Are the Benefits of Ginger Honey Crystals? Ginger and honey, crystallized in an on-the-go candy, might provide natural relief from a variety of ailments, including respiratory infections, indigestion and motion sickness. Ginger, rich in calcium, iron, vitamin C and carotene, might offer relief to those suffering from a cold or cough. According to the National Center for Biotechnology Information, ginger has been used for thousands of years for the treatment of ailments, including colds and nausea. Honey, nature's nutritive-rich healer, is prized for its medicinal properties and antioxidants, according to "Yoga Journal." Packed full of flavonoids and phenolic acids, honey can help bodies fight disease. When used together, honey and ginger can provide a natural remedy for illnesses, and, with a tantalizing sweet and spicy taste, this is one medicine that's easy to swallow. The mixture of honey and ginger acts as an expectorant, and can provide relief to a person suffering from a cough, sore throat or runny nose. Also, ginger and honey crystals are used as a prevention. 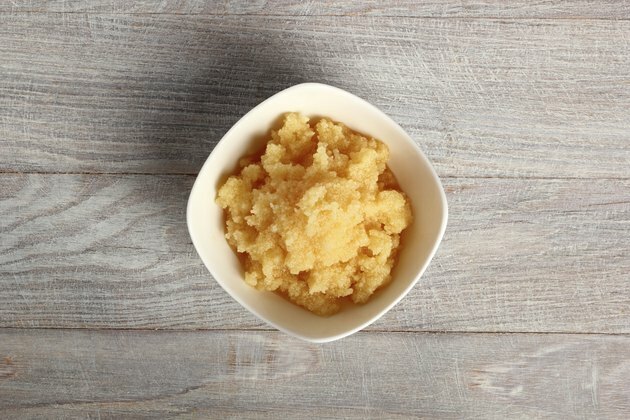 At the first symptoms of a flu or cold, ginger and honey crystals stimulate the immune system and provide a dose of much needed vitamin C.
When overeating, or experiencing abdominal cramping, ginger and honey crystals can ease the discomfort of an upset digestive track, according to Health Guidance.org. Additionally, ginger helps the body digest food and increases circulation by relaxing muscles and blood vessels. Ginger and honey candies are also useful to a traveler. When experiencing motion sickness, they can restore the body's equilibrium and ease the dizzy feeling caused by traveling. The University of Maryland Medical Center (UMMC) suggests ginger as a natural way to reduce the symptoms of motion sickness and does not have the side effects that conventional prescription medicines have, such as dry mouth and drowsiness. In one UMMC trial of 80 new sailors who were prone to motion sickness, those who took powdered ginger had less vomiting and cold sweating compared to those who took a placebo. When buying honey and ginger crystals, read the label. Make sure there are no artificial additives or extra sugar added. Often, honey and ginger crystals are treated as candy and even dusted with powdered sugar, so visit your local health food store and look for crystals containing only raw honey and ginger. How Does Ginger & Honey Tea Give Health Benefits?